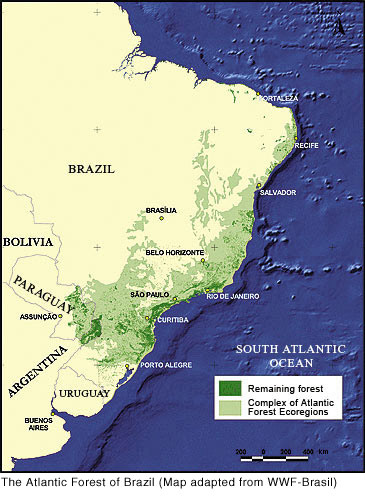 The Atlantic Forest domain stretches from the northeastern to the southern regions of Brazil, northern Argentina and southeastern Paraguay. In the northeastern part of Brazil it occupies a thin coastal strip not exceeding 40 miles in width, while in the south it extends from the coast to as far as 200 miles inland. Today more than 92% of this forest has been cleared and what remains is highly fragmented. The Atlantic forest of Brazil, home to 5 percent of the world's fauna and 7 percent of its flora, is now the second-most endangered rain forest in the world after the near extinct jungles of the island of Madagascar. The Rio Cachoeira Nature Reserve (25°18’51’’S, 48°41'45’’W) is located at the coast of the Brazilian state of Paraná, inside the the largest remaining tract of contiguous Atlantic rain forest in Brazil. The 8.700 ha reserve is a protected area owned and managed by the SPVS (Portuguese acronym for the Society for Wildlife Research and Environmental Education). SPVS is an NGO based in Curitiba (Paraná, Brazil) and works toward the conservation of nature by protecting native areas, by carrying out environmental education programs and by developing models for the rational utilization of natural resources. The regional climate is humid subtropical with mean temperatures between 16.2°C in July and 24.5°C in February. Precipitation (2580mm/yr) is well distributed throughout the year with less rain from May to August. 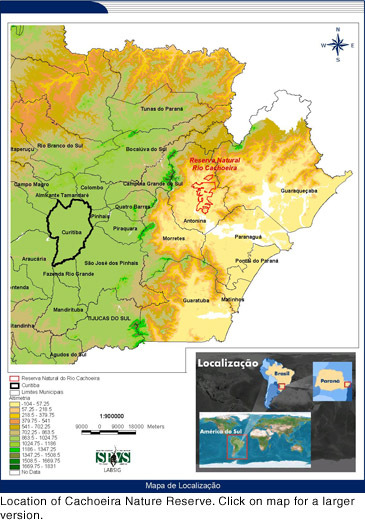 Topography varies from littoral plains with isolated hills to the uplands of the Serra do Mar mountain range. Altitudes range from 0 to 600 m above sea level. Lowland and submontane forests originally covered the area. These dense ombrophilous forests were submitted to intense exploitation and many areas have been converted to pastures. Exploitation of mature forests was especially severe in the coastal plains, where easy access encouraged removal of timber. Thus, old growth forests have vanished on coastal plains but are still prevalent in hillsides. The resulting landscape mosaic consists of old growth forests, secondary forests in various stages of regeneration and pastures.